Mom and Dad arrived yesterday, and after their hearty breakfast at the Gingerbread Mansion, we went up to Eureka to watch this tall ship come in. Mom and Dad got impatient because the ship did not arrive exactly at noon as promised, but what do you expect from a sailing vessel? Just as we were about to leave I heard a cannon shot in the distance. A minute later the ship came into view. There was a little rowboat with period dressed sailors following them and we assumed they were with the big ship, but we found out later they weren’t but they were there to provide a special greeting to the Lady Washington. Their greeting was relayed by means of firing their little cannon that they had on the bow of their rowboat. So the Lady Washington began returning fire, and even though they were out in the bay, the reports were loud enough to set off several car alarms. Once they finally docked we all took a tour of the interesting, but very cramped quarters. 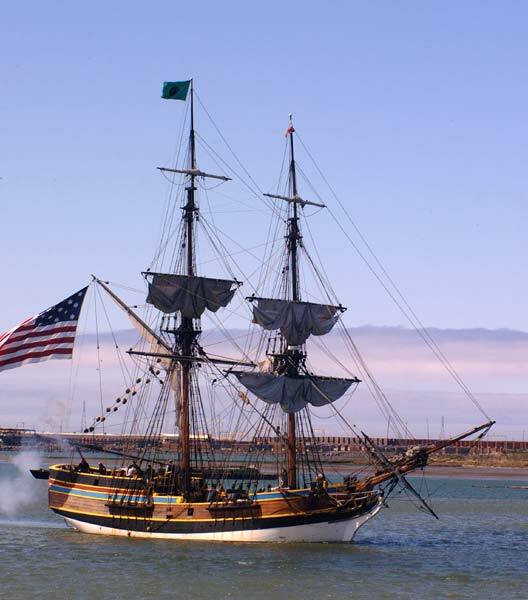 Note: We found out later that right after the Lady Washington left Eureka, she went off to star in a Hollywood Movie. You might have seen her in Pirate’s of the Caribbean.